There are a lot of things going into the making of a notebook that users can’t see by just looking at the specs sheet so that’s why we decided to shed some light onto the most important aspects when choosing a laptop in a series of articles. And we will kick things off with a simple selection of gaming notebooks with the best cooling systems that we’ve tested throughout 2017. Of course, it’s needless to say that we’ve only included machines, which we’ve reviewed and tested. Surely there are a lot of other notebooks worth mentioning but we will stick to the ones we’ve tested thoroughly. Another thing to keep in mind – these are not the best gaming laptops nor the best bang for your buck deals. The list is solely focused on gaming notebooks with the best cooling performance without taking into account display quality, price/performance ratio, keyboard, touchpad, features etc. In addition, we used a method of stress testing that doesn’t represent real-life usage scenarios because even the most demanding games don’t ramp up the CPU and GPU usage to 100% all the time. However, we find this type of stress testing the most reliable way to assess the overall stability and effectiveness of the cooling system in the long run and makes it that easier to compare the results to the rest of the systems we’ve tested. In reality, all of the notebooks below will perform even better during intensive gaming. We decided to start with an old gem from the end of 2016, which is still available on the market and can be found with various CPU configurations but the GTX 1070 is still the staple of the system. It’s rather unfortunate that the ASUS ROG series didn’t really impress us with effective cooling solutions with their newer models from 2017 but the G752VS always makes up for the disappointment. Just like every notebook out there, the G752VS has its quirks and drawbacks but the cooling system definitely isn’t one of them. Featuring four heatpipes (two for each massive heatsink for the CPU and GPU) and two big cooling fans, the system handles the heat with ease even under continues and heavy workload. This, of course, comes at a “thick” price – the G752VS isn’t portable by any means. Anyway, digits speak for themselves – stable clock speeds at relatively normal temperatures under heavy workload without any signs of thermal throttling while keeping the interior as cool as possible. In any case, we strongly recommend reading our full review here and also take a look at the charts and heat map below. Also, keep in mind that the G752VS we’ve tested was an engineering sample so the end production units will most definitely perform even better in this regard. Next down the line is one of our favorites – the Acer Predator 17 with GTX 1070. The lineup is fairly new and has been around for only two generations and surprisingly, Acer made their Predator lineup a hit from the very first try. Even though at first glance the cooling system doesn’t seem to be anything special, Acer boasts with its thin AeroBlade metal blades of the cooling fans that allow for a better airflow. Other than that, the system sports the usual thick copper heatpipes and solid heatsinks. But as to be expected, thickness and weight might be problematic for some users. Once again, the Predator 17 we’ve tested was an engineering sample and the thermals on the end production unit should be even more impressive. If you look at the charts below, you will see that the system utilized the full potential of the CPU and GPU while keeping the outer temperatures frosty. Some may call it clunky some may call it hefty and they are probably right. With those big screen bezels and enormous body, the Legion Y920 doesn’t strike us as portable for sure but it’s hard to deny its effective cooling system. Sporting two massive cooling fans and enormous heatsinks connected with three heatpipes, the Legion Y920 handles the overclocked Core i7-7820HK and overclocked GeForce GTX 1070 with ease – no thermal throttling, full utilization of both chips and exceptionally low GPU operating temperatures. Temperatures on the surface also remained pretty as you can see from the heat map below. Yet another GTX 1070-powered notebook makes it to our list and this time it’s part of HP’s brand new and overhauled Omen 17 lineup from 2017. To be honest, we were a bit skeptical at first as disappointment still lingers at the back of our heads after the utter disappointment of the previous Omen generation. 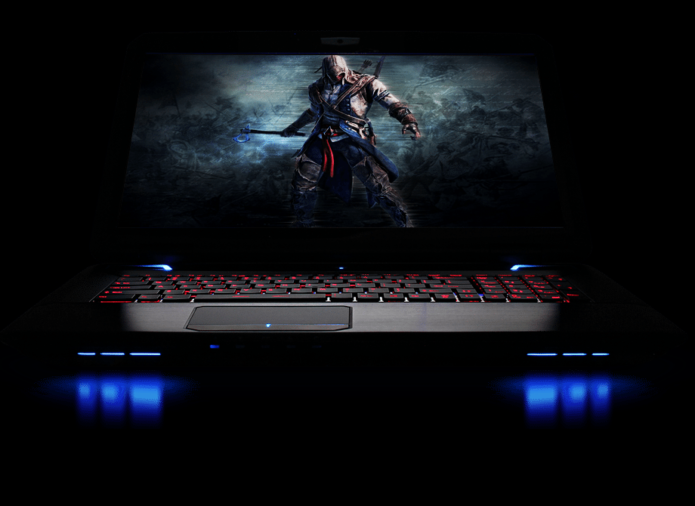 However, HP seems to have taken serious notes and has fixed almost all of the flaws that plagued the previous generation of Omen gaming notebooks. The cooling system is probably the key selling point in this model, although it looks like the rest in this article. But in addition to the usual heatpipes and heatsinks, HP has included a few metal plates that should help with the heat dispersion. And to prove its effectiveness, we’ve included some screenshots from the stress testing – full CPU and GPU utilization and exceptionally low GPU operating temperatures. And when you consider the fact that the Omen 17 is one of the few testing samples that we reviewed, the end production units should perform even better. So here’s the first 15-inch entry into this list – the Inspiron 15 7577. The refreshed mid-range gaming Inspiron didn’t impress us with great overall user experience but it did exceptionally well in our intensive combined CPU + GPU workload. So if you are willing to overlook the rather hefty base and color-deficient screen, the Inspiron 7577 should be able to withstand pretty much everything you throw at it without breaking a sweat. The abnormally low temperatures during our extensive stress test are here to prove it. Still, the cooling design isn’t anything out of the ordinary – two big heatpipes connecting the heatsinks to the cooling fans placed on each side. In any case, we suggest reading our full review before buying. Ultra-portable and ultra-powerful. Those words are not oxymorons anymore in the notebook gaming world anymore. But while most laptops advertise good cooling performance without sacrificing portability, the Acer Predator Triton 700 actually achieves it. Sporting an unusual design, awkwardly-placed touchpad and solid cooling design (thanks to the huge heat-dispersing plates and probably 3D blade design that’s inherent to most Predator laptops), the Predator Triton 700 surprises with decent overall temperatures under extended heavy workload. Surely, CPU and GPU temperatures reaching 90 °C and 78 °C isn’t impressive by any means but just think about the powerful quad-core Core i7-7700HQ processor and the absurdly fast GeForce GTX 1080 Max-Q crammed inside the 18.9 mm thick and 2.39 kg 15-inch chassis. Now it doesn’t sound all that bad, right? Especially when you consider the fact that you won’t feel the heat under your fingers due to the unconventional design. Read the full review to understand that there’s more than just powerful hardware behind this little beast. When we mention the Acer Predator Triton 700, we can’t go without mentioning the ASUS ROG Zephyrus GX501 as well. Both notebooks are identical in many ways, including the screen and how they perform under extensive and heavy workload. However, ASUS’ solution to the demanding Core i7-7700HQ and GTX 1080 Max-Q chips is a bit different. While the Triton 700 relies on the new design and their 3D blade design for the fans, ASUS has opened up the interior for extra cool air intake and an additional mechanism lifts up the base serving as an external cooling pad. In any case, both methods appear to be just as effective because the Zephyrus performed almost identically on our stress test, although the GPU ran at a bit lower frequency. The Acer Predator 17 X is one of the oldest in this list but still packs a punch while offering an excellent cooling solution. Yet again, like most of the times, the price of a good cooling design is a hefty chassis. It’s still impressive how the system manages to keep the heat away from the user while running the Core i7-7820HK and the full-fledged GTX 1080 on full throttle (both of them overclocked). How is it doing it, you may ask. Well, it’s pretty simple actually. The front of the notebook has a cooling fan that draws cool air, pushes it into the chassis while the other two fans disperse the heat from the back. Acer claims that the cooling fans are responsible for the excellent cooling performance due to their 0.1 mm thin metal blades that allow up to 15% better airflow. We can’t confirm this but if it works, why not? The recently reviewed ASUS ROG Strix GL702VI made it to our list of best cooling solutions on a laptop quite easily, despite all of the apparent drawbacks that the notebook has. Anyway, we are not here to talk about them but instead focus on the frosty cooling system. On contrary to most GTX 1080-powered laptops, the GL702VI surprises with considerably lower weight while still maintaining low temperatures under load. And like previous generations of ASUS ROG notebooks, this one draws cool air from between the keycaps of the keyboard and pushes it out from the back thanks to the huge cooling fans, heatpipes and heatsinks. Keep in mind, though, that these cooling fans come with a price – exceptionally loud operation, especially when you boost them at 100%. And finally, something more exotic – the MSI Titan SLI series. These monsters carry not one, but two desktop-grade NVIDIA GeForce GTX 1070 or GTX 1080 graphics cards working in SLI mode. Obviously, this notebook isn’t made for frequent moving around but you can definitely rely on the Titan SLI to get some serious rendering work or gaming on the go. The Titan SLI keeps things cool under load with overclocked CPU and two GTX 1070s running at 1518 MHz at the respectable 70 °C. It does so thanks to the enormous vents on the back and one on each side. But the cooling system isn’t everything that the Titan SLI has to offer so check out our full review to learn more. Surely, there are other notebooks with great cooling solutions out there but we’ve included only the ones we’ve tested and seen for ourselves. Also, keep in mind what we’ve said from the beginning – all tests are performed under extreme and long workloads so even if you think that some of the temperatures are higher than they should, remember that these machines are not desktops, they are portable (relatively, of course) notebooks. We also suggest reading the full reviews of all the listed notebooks before buying because the cooling solution isn’t everything and you might end up with a gaming notebook that doesn’t suit your needs.